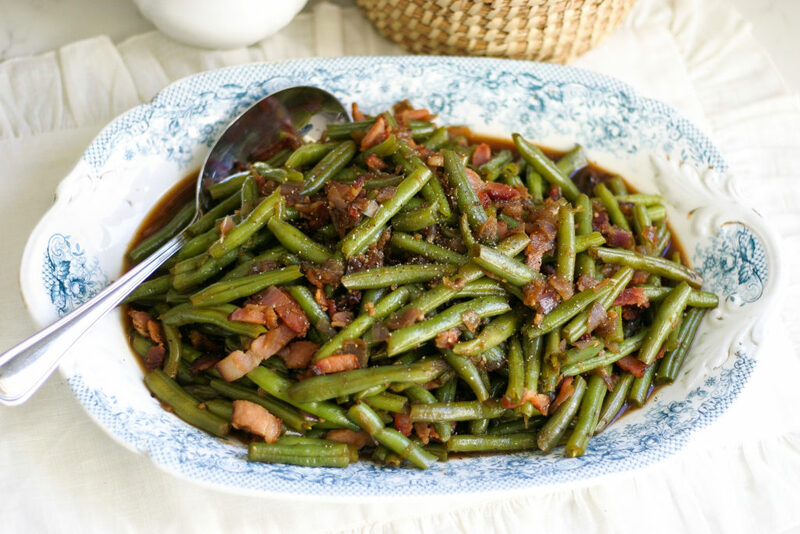 Instant Pot Caramelized Bacon Green Beans - Jenuine Home - Interior design, decor, diy for your home and Instant Pot Creations for your tummy. 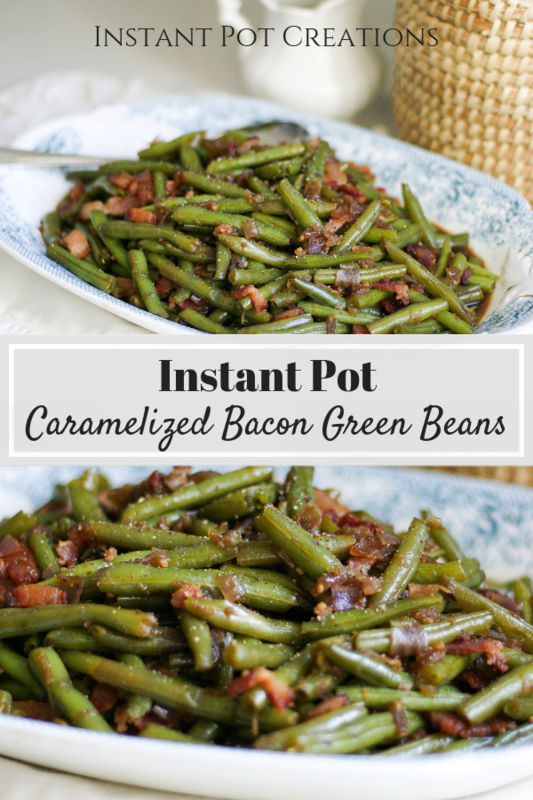 I’m just going to say it, we are in love with these Instant Pot caramelized bacon green beans. We are not, however, fans of the typical green bean casserole that’s served during the holiday meals. Don’t hate me! The thing is, usually the green bean casserole is made with cream of mushroom stuff that gives both my hubby and I shivers of digust. The only part I like to eat is the unhealthy fried crunchy onions on top and those don’t exactly count as eating vegetables. We do love to have at least one side of vegetables with our holiday meal and simple steamed green beans seasoned with salt and pepper, was the usual choice. Then bacon entered the green bean scene. Using the Instant Pot, we were able to make these fresh green beans into an easy instant pot carmelized bacon green beans masterpiece. Make this for your next holiday meal, especially if you’re in charge of bringing a side, and you’ll have raving fans. But why keep it to the holidays? Make it anytime you get the craving. Fresh green beans means best tasting fresh flavor, more nutrients and excellent tender texture when you bite into them. 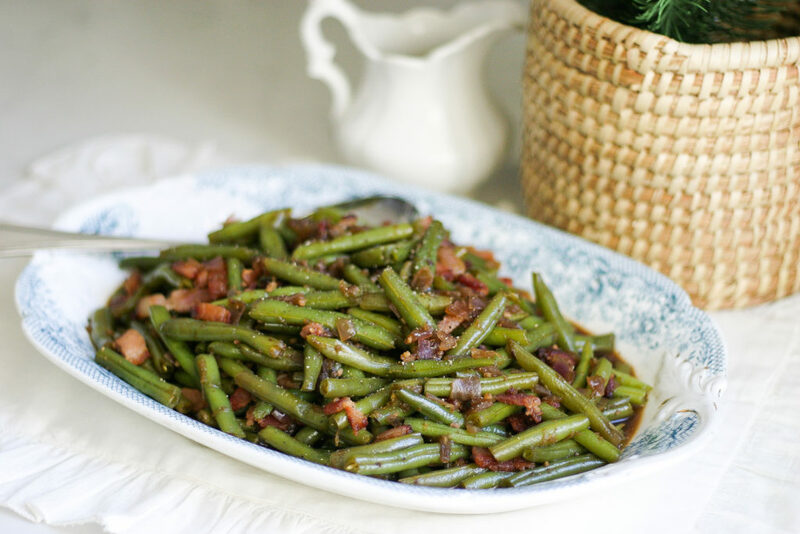 Onions and garlic provide depth and flavor that also brings delightful aromatics to the instant pot carmelized bacon green beans. If you want to multi task to help save some time and don’t mind washing one extra dish, I also share my oven method for cooking crispy bacon. I usually opt for cooking the bacon in the oven because it does save me time and I can cook all of the bacon together on the pan! Trust me, taking the extra time to add bacon to this dish is what makes this incredible. My family gobbles this up so quickly, it’s ridiculous. Line a large cooking sheet with foil (for easy clean up later). Place bacon on cookie sheet, without overlapping bacon pieces. Place bacon in a cold oven. Turn oven on to 400F and cook for 18-20 minutes or until crispy. Remove bacon from oven and place on a paper towel lined plate to absorb the grease. Once cooled, chop bacon into bits. Push saute mode on the Instant Pot. 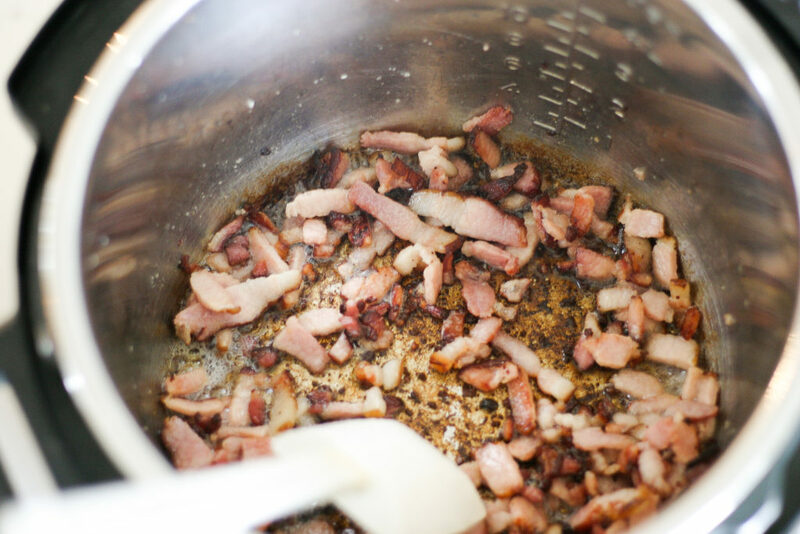 While the pot is heating up, chop bacon into 1/4″ slices. When screen reads HOT, add bacon and cook until crispy. The grease from the bacon will release, therefore no additional oil is needed. You may have to cook in 2 batches. Remove cooked bacon and allow to rest/drain on a plate covered with 2 layers of paper towels to absorb the grease. Make sure to deglaze the pot by adding 1/4 cup of water to help loosen up the cooked on bacon bits in the pot as you scrape with a spatula. This takes about 3-4 minutes to do. Deglazing the pot prevents any BURN error on the screen when pressure cooking afterwards. Push saute mode on Instant Pot. While the pot is heating, cut up bacon into 1/4" sized strips (to make into bits). When Instant Pot screen reads HOT, add bacon. The grease from the bacon will release and be the only cooking oil you'll need. Cook until crispy. You may need to cook in 2 batches. Or cook bacon using the oven method (see notes). Drain all but 1-2 tsp of bacon grease from the Instant Pot and discard. Saute onion in pot until transluscent. As the onion releases juices, scrape the bottom of pot to help it release cooked on bacon marks. Add garlic and cook for 1 minute. Add 1/4 cup water into pot and deglaze pot by scraping bottom of pot with spatula until bottom is smooth/clean. This prevents a BURN error. Add green beans, 3 tbsp water, close lid and turn knob to sealing. Cook on high for 5 minutes. Quick release pressure when cooking is done. Open lid when safe to do so. Push cancel button and push saute mode. Add coconut aminos, coconut sugar, salt and stir together in the Instant Pot. Saute for 3-5 minutes, until sugar has melted and caramelized a little. Sauce will be thin. 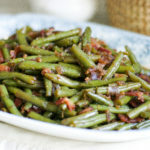 Add bacon bits to the green beans and mix well. Serve with fresh cracked pepper on top, if desired. Pairs well with mashed potatoes, stuffing, holiday favorites or any time of the year! Line a large cooking sheet with foil for easy clean up later. Place bacon on cookie sheet, without overlapping bacon pieces. Place in cold oven. Turn oven on to 400F and cook for 18-20 minutes or until crispy. Remove bacon from oven and place on a paper towel lined plate to absorb the grease. Enjoy! I love green beans, but these are just on a whole other level! I can’t wait to try these! Thanks for the recipe, Jennie! They truly are! My kids don’t even think of them as vegetables because, bacon. Enough said.